Fashions of Time: I'm a Versatile Blogger!!! 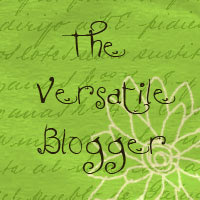 A big thanks to Comtesse Olympe De La Tour d'Auvergne, who was gracious enough to award me the Versatile Blogger Award! YAY!!! I guess the name change of my blog worked ;) I am enjoying my time in other centuries of fashion, and of course I like to ramble in general. 5) I eat out too much but LOVE IT! 6) I plan to get some more edumatcation in the next few years....how cool would a Masters be???? 7) I want to plan a trip to Europe in 2011 or 2012...some place I can dress up many times during my visit...anyone want to join? 1) Festive Attyre or on livejournal- Fellow DFW Guild Member and AWESOME costumer!!! Everything she makes always looks so polished. 2) Time Travelling in Costume - Fun variety of pretty dresses. 4) Costume Diaries -Beautiful work and lots of variety!! What Color Did You Want?